There is a major stigma of poverty and serious social, economic and environmental problems in the Jequitinhonha Valley. But the region, despite all its difficulties, is also one of the richest of Brazil in terms of culture and craft production. 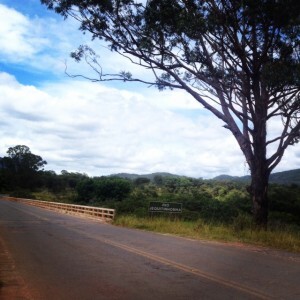 Located in the northern state of Minas Gerais, the Valley is home to some 80 small towns that in the heyday of mining attracted immigrants from all over the country, after the wealth of mineral resources in the area, including gold and diamonds. Today, centuries after all the predatory mining that took place, the region suffers badly with lack of opportunities. The typical drought and blazing sunshine does not make things easier for the local families – husbands often have to seek farming work in other places during the dry season, which can last as long as eight months. 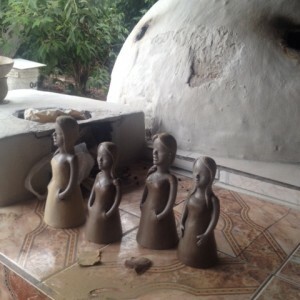 Faced with the arduous job of looking after the home and children, as well as getting by with any scarce crops the family may have for its own subsistence, the women of the Valley found the terracotta-based items that many of them had been making since they were little girls to be an opportunity to improve their financial situation. 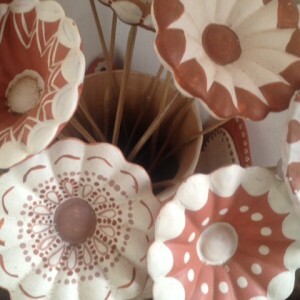 The production of clay items in the Valley began with the manufacture of utilitarian pieces that were made ​​by women called “paneleiras” (the “pot-makers”). The tradition, was passed down generations and is said to have started with the native indians of Brazil. The Valley’s artisans then started to produce decorative pieces in rudimentary wood stoves, using little rolls rather than the potter’s wheel, as well as other very basic tools. The pigments used in the painting of craft made in the Valley are still extracted from natural clay, which is found in many deposits of the region. 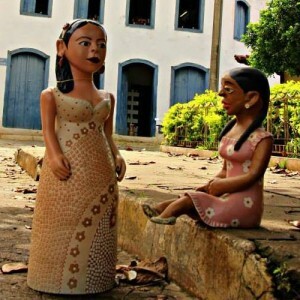 It was not until the 1970s that the clay dolls that the Jequitinhonha artisans are so famous for came about. The female figures with their chin up – a feature interpreted as a sign of feminine assertion – and elaborate clothing started to become a real possibility to earn money. Led by Maria José Gomes da Silva, an veteran maker from the region best known as Zezinha, the women from the region then started to dedicate more time to making and improving their skills in the 1990s, as well as producing and selling items through local associations. Many of these women live in remote communities without access to transport and outlets to sell their items. Government support and promotion, as well as a growing interest in local craft from the Brazilian audience mean things are better than they used to be – but still not enough to pull these families out of the poverty they are in. As we got to know the life of the Jequitinhonha Valley makers, we discovered a new paradox, where the economic poverty and the cultural wealth are two extremes permeating various apparent opposites: past and present, immigration and emigration, fame and anonymity, simplicity and glamour, droughts and floods, scarcity and abundance. All of this creates a reality in the deep hinterland of Brazil with the distinctive feature of social and cultural diversity. 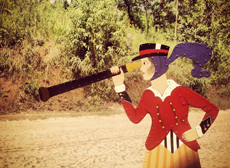 This is the first part of our series of articles about our trip to the north of the Brazilian state of Minas Gerais, which is part of our series of journeys around Brazil to find the most original craft and the people who make it. Follow our updates on Facebook and check out our collection of unique Brazilian craft items.